Hybrid hard drives promise some of the performance of a solid-state drive with the capacity of a mechanical drive. They’re bigger than an SSD and faster than a plain-old mechanical drive. These are sometimes called “SSHDs” — solid-state hybrid drives. The drive automatically caches data in the solid-state storage for you, offering faster speeds for the files you use most. Solid-state drives are much faster than mechanical drives. Prices have come way down, so you should definitely look at upgrading to an SSD. But even these now-cheaper drives have less storage capacity. A solid-state drive might cost about $0.58 per GB, while a mechanical drive might cost $0.06 per GB. A mainstream solid-state drive at a reasonable price might offer 256 GB of storage at most, while a mechanical drive might offer 2 or 3 TB of storage. Mechanical drives may be slow, but they offer a very large storage capacity at a very low price per gigabyte. To get the advantages of both, many power users and PC gamers use both a solid-state drive and mechanical drive in their systems. The solid-state drive is used for system files, programs, application data, and anything else that really benefits from the speed. The larger mechanical drive can be used for long-term storage of files that don’t need to be accessed as quickly — a media or photo collection, for example. This requires installing both drives in the computer and choosing which files and programs to place on each drive. If you want to move a file to a different drive, you’ll have to move it yourself. If you want to move a program to a different drive, you may have to uninstall it and reinstall it at a different location. A hybrid hard drive contains both a traditional magnetic drive and the amount of solid-state storage you’d find in a small solid-state drive. Importantly, this hard drive appears as a single drive to your operating system. You’re not in charge of deciding which files go on the mechanical drive and which files go on the solid-state drive. Instead, the drive’s firmware manages what is and isn’t on the solid-state drive. The SSD portion of the drive acts as a “cache” — files you access frequently, such as your operating system files and program files — are stored on the SSD portion of your drive by your firmware. Although this is a cache, it’s stored in non-volatile solid-state memory — that means it persists across reboots, so it speeds up your startup process. The goal is to have the drive access system and program files with the speed of a solid-state dive, and provide the storage capacity of a magnetic drive for other files. The drive handles this on its own — you don’t have to shuffle files around or decide what goes where. Importantly, most hybrid drives have a fairly small amount of SSD storage. The top hybrid hard drives on Amazon have 1 TB of mechanical space and only 8 GB of solid-state memory. 8 GB is a decent amount of storage space for holding system files and programs, but it doesn’t compare to 128 GB or 256 GB that can hold all your system and program files. Apple’s “Fusion Drive” is also a hybrid drive, offering 1 TB or 3 TB of mechanical drive space alongside 128 GB of solid-state flash storage. Why Would You Want a Hybrid? Hybrid drives can be cheaper than solid-state drives because they contain a smaller amount of solid-state memory. A 2 TB hybrid drive with 8 GB of solid-state cache memory will be more expensive than a simple 2 TB mechanical drive, but likely less expensive than a 256 GB solid-state drive with even less total space. 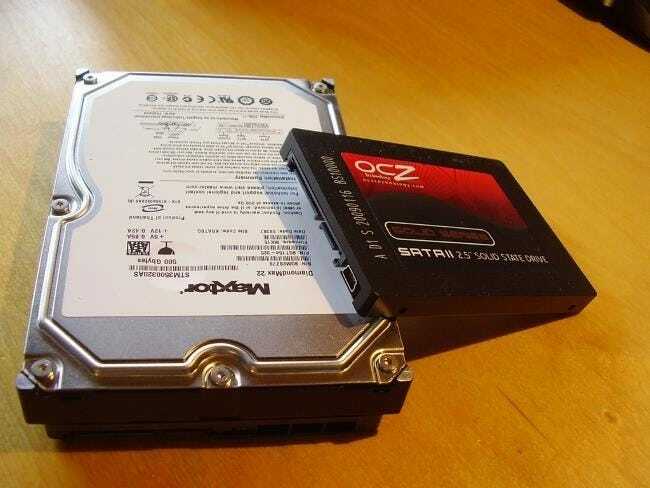 Computer manufacturers include these drives in their computers to offer solid-state speeds at a lower price with more storage. A hybrid drive is also a single physical drive, which can be a big advantage. If you have a laptop with a single drive bay and you want both solid-state speeds and mechanical drive storage capacity, a hybrid drive is the one thing you can put into that drive bay to get both. It’s all about price and storage capacity. If magnetic, spinning-platter drives and solid-state drives currently cost the same amount per GB, there’d by no need for hybrid drives at all. A solid-state drive would be superior in every way. Hybrid drives are only useful because solid-state drives are still more expensive per GB. If you want both solid-state speeds and a large amount of storage space, having a hybrid drive may be simpler because the drive moves files around for you. You don’t have to think about which files should be where or deal with two separate drives in your operating system. A hybrid hard drive will be significantly faster than a mechanical drive. That caching algorithm will store operating system and program files in the solid-state memory, offering solid-state speeds when accessing cached files. Hybrid drives start on the slow side. When you start using a hybrid drive, no caching will have occurred — so the drive will be just as slow as a traditional mechanical drive. As you use the drive and it learns which files should be cached, speed will gradually improve. A single solid-state drive — or a solid-state drive plus a mechanical hard drive in a desktop PC, if you have room for both — will outperform a hybrid drive. Everything on a solid-state drive will be as fast as the small cache portion of a hybrid drive. By installing your operating system and programs to a solid-state drive, you can ensure those files benefit from the fastest access times possible. Managing this on your own will likely offer better performance. As solid-state drive prices continue to decline, we expect to see less hybrid drives — especially as most people don’t really need 2 TB of space on their laptops and desktop PCs. A smaller solid-state drive with a few hundred gigabytes would be just fine — and faster, too.